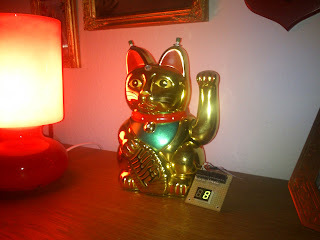 Rebuilt my lucky cat: whenever a page of my website is loaded, the cat will be waving its arm. There’s a light sensor so when its dark, the cats RGB-LED is changing the color instead of waving the arm. Changing the color of the LED is also possible with one of the buttons on the cats ears. The other one is the reset button. Used an arduino ethernet, a servo, two buttons, an RGB LED and two small yellow LEDs. The seven segment display is one that I harvested from an old stereo. It’s driven by the arduino and two shift registers. unfortunately I’ve soldered that one together for an older project, so that it doesn’t fit into the cat too. It shows the number of pageviews of the website. This is a excellent site, could you be involved in doing an interview about just how you designed it? If so e-mail me! Wonderful website. Plenty of helpful information here. I am sending it to several buddies ans additionally sharing in delicious. And naturally, thanks on your sweat!